It might surprise you to learn that improper ergonomics at work can drastically increase your overall stress levels. It’s true, but luckily, it can be fixed with some simple adjustments and strategies. If you are performing repetitive tasks, sitting too much, or lifting things improperly at work, you will be more likely to experience chronic headaches, musculoskeletal problems, and health conditions related to being sedentary. When you add to that other workplace pressures such as dealing with supervisors, co-workers, and the public, it’s a recipe for some serious stress. Luckily, adjusting your working conditions to decrease the health problems associated with poor ergonomics can help you feel better and experience lower stress levels. Keep commonly reached for items as close to you as you can, to minimize your movements when grabbing them. If you are on the phone for long periods, don’t use a receiver. Instead, use a headset or speaker. Get a good chair that is as adjustable as possible and set it up for your personal needs. Your feet should be flat on the floor with your knees at a 90-degree angle. Your wrists and forearms should be held by the armrests at a neutral angle, and you shouldn’t have to reach for your keyboard or mouse. 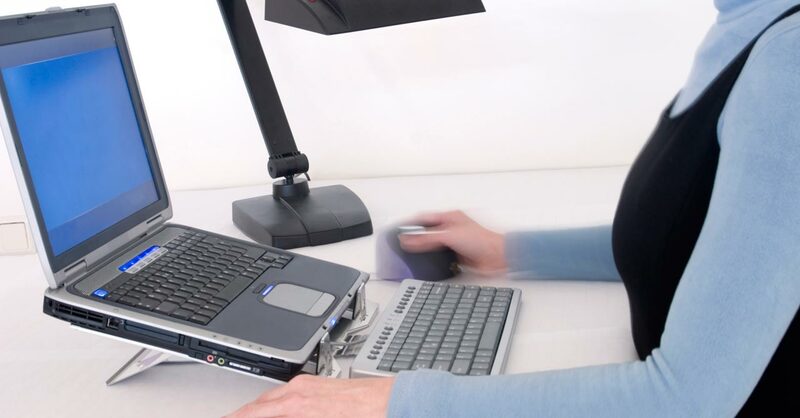 Get an ergonomic keyboard and mouse, and set them up per the instructions included to best suit you. If you spend a lot of time typing, consider investing in voice recognition software and a good headset. If you sit a lot for work, get up at least every 30 minutes. Do some jumping jacks or squats to allow gravity to act on your body. Consider using glasses that help minimize the eye strain of looking at a computer for long periods of time. If you feel that something about your workplace is not ergonomically sound, and it’s adding stress to your life and affecting your health, talk with your manager about it to see what can be done. After all, decreasing employee stress and illness is better for the company, too.